Xiaomi M1901F7BE Receives 3C Approval; Could it be Redmi Note 7 Pro? - Playfuldroid! Xiaomi M1901F7BE Receives 3C Approval; Could it be Redmi Note 7 Pro? A new Xiaomi phone with a model number of M1901F7BE has been certified by the 3C authority in China. Since the model number resembles with that of the Redmi Note 7, it is speculated that it could be the upcoming Redmi Note 7 Pro handset. The M1901F7C, M1901F7E, and M1901F7T are the model numbers of the Redmi Note 7. 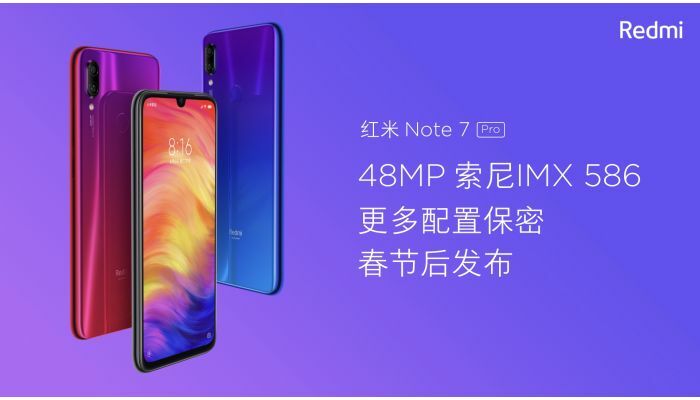 On Jan. 10, when Redmi had introduced the Redmi Note 7 smartphone, it had claimed that it will be announcing the Redmi Note 7 Pro after the Spring Festival. Hence, the M1901F7BE that has been approved by the 3C body now is believed to be the Redmi Note 7 Pro. The 3C listing states that the MDY-08-ES charger that will be coming with the phone will support up to 18W charging. The Redmi Note 7’s dual camera system has 48-megapixel Samsung GM1 as main sensor. It will be replaced by Sony IMX586 48-megapixel sensor on the Redmi Note 7 Pro. Rumors have it that the Note 7’s Snapdragon 660 will be also replaced by Snapdragon 675 on the Pro model. The other changes that may arrive on the Note 7 Pro is the inclusion of 6 GB of RAM and 128 GB of storage. The other specs of the Pro model will be same as the regular variant. Hence, it will be coming with 6.3-inch LCD panel with full HD+ resolution, 4,000mAh battery and Android 9.0 Pie OS with MIUI 10.